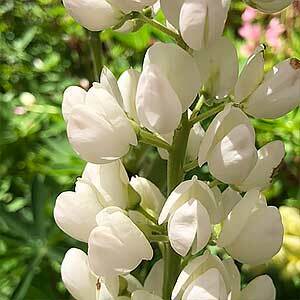 Lupinus x polyphyllus (Russell Lupins) are the most popular flowering lupins. With wonderful tall flower spikes to 1m in height, and come in a range of flower colours. Flowering in early summer Russell Lupins with tall flower spikes are a great feature in the garden border. These are a clumping perennial with attractive foliage and flower spikes that rise to over 1m in height. These are a clump forming perennial plant, and they are popular for the tall colourful flower spikes. Growing to 1 – 1.5m Russell Lupins are used widely in garden borders. Flower colours vary from white through to purple and orange. You will also find bi colour varieties in some nurseries. A warm sunny position in a humus rich well drained soil is best. Russell lupins can be grown from seed sown in early spring or from the tubers. They are best in a humus rich moist soil and in warmer climates, protection from the hot afternoon sun is best. Russell lupins will self seed, so deadhead or collect seeds heads to prevent spreading. Seed can be collected from spent flower heads or tubers can be divided once established. 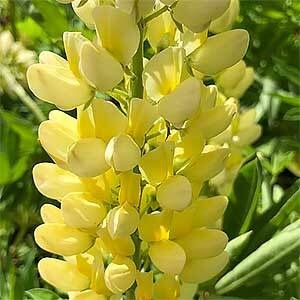 If you plant Lupin seeds in spring they will take from 6 months to 18 months to flower. For faster flowering try geminating the seeds in a heated propagating tray stating them mid winter. You can pot them up and then plant them out in spring. Transplanting can be a problem, however if you use biodegradable pots so as not to disturb the root system this can be overcome.